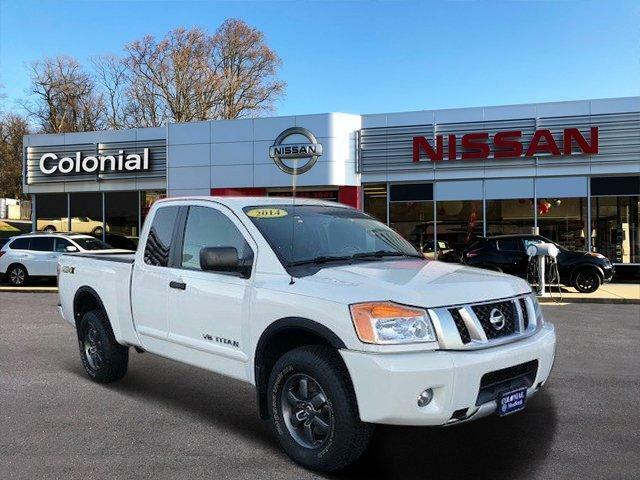 Highlights of this 2014 Nissan Titan PRO-4X include: CARFAX 1-Owner, GREAT MILES 66,213! REDUCED FROM $22,638! PRICED TO MOVE $900 below NADA Retail! Satellite Radio, iPod/MP3 Input, Bluetooth, Back-Up Camera, Hitch, Aluminum Wheels, 4x4. KBB.com's review says If you're looking for an alternative to the herds of domestic half-ton pickups, the 2014 Nissan Titan offers a unique twist, with a stylish exterior, roomy interior, rugged construction, and a proven reliability record..
PRO-4X LUXURY PACKAGE Memory Outside Mirrors, Pedals & Driver Seat, Heated Dual Front Captain's Chairs, 8-way power driver seat and 4-way power front passenger seat, Navigation w/NissanConnect, streaming audio via Bluetooth, USB connection port, Pandora radio capability, NavTraffic and NavWeather, hands-free text messaging assistant, Google Send-to-Car and Points of Interest powered by Google, In-Cabin Microfilter, PRO-4X PREMIUM UTILITY PACKAGE Power Adjustable Pedals, HomeLink Universal Transceiver, Utili-Track Channel System, 4 adjustable tie-down cleats, Rear Overhead Console, Power Heated Extendable Tow Mirrors, Factory Applied Spray-On Bedliner, Radio: Rockford Fosgate Premium Audio System, 10 speakers including subwoofer and center speaker, Tailgate Area Illumination, 120V Bed Outlet.